The Crossing has always been a strategic location in Canadian Rockies from the days of the Fur Trade in the early 1800’s through to the present day. At this location, the Mistaya and the Howse Rivers meet the North Saskatchewan River and at this point the Fur Traders crossed the North Saskatchewan River, following the Howse River to the Howse Pass which breeched the Rocky Mountains into what is now the province of British Columbia. 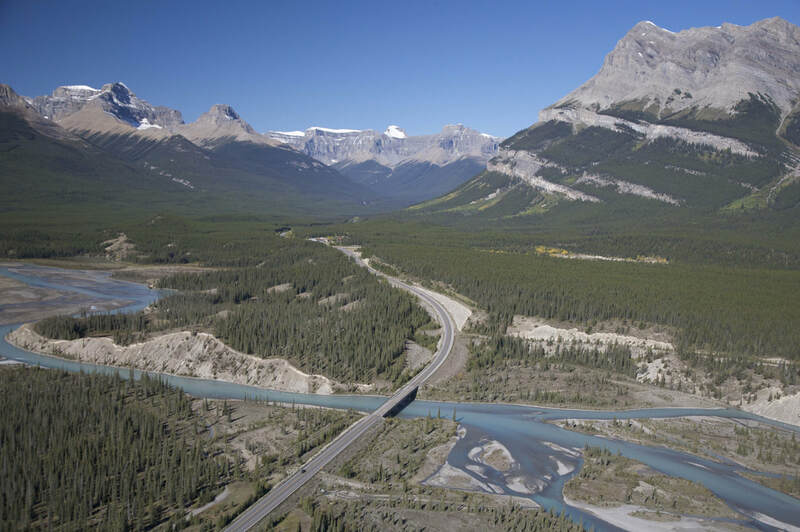 In 1940, the first Banff-Jasper Highway was opened to the public and once again, The Crossing was identified as a strategic location as it lies in the heart of the Rockies equidistant from Banff and Jasper. A small bungalow court and service centre was constructed at The Saskatchewan River Crossing, to provide necessary services to the traveling public. Then in 1968, Highway 11, The David Thompson Highway was completed to the junction with the Icefield Parkway at – where else? The Crossing! The David Thompson Highway connects the Icefield with Rocky Mountain House, the City of Red Deer and Central Alberta. Today’s Crossing Resort includes 66 deluxe rooms, a large service centre, with a 250 seat dining room, 200 seat cafeteria, General Store and Gift Shop and has devolved to become the “Hike and Attraction Central” for the Icefields Parkway.